I recently went on a little adventure during my day off, and thought I’d share it with you. I live in Atago, near Muromi station. Every day when I travel to work, I need to cross Muromi Bridge. When I cross it, I can see Fukuoka Tower to the left, and a mountain range to the right. I’ve always wondered just how far away those mountains are, and whether or not I could climb them! On my day off, I decided I would get on my bicycle and ride in the direction of the mountains and see what happens! I was a little worried because my bicycle isn’t exactly…good. I bought it for 1000 yen about 8 months ago! But, luckily, there was no problem. Anyway, I set off at 9:00am. It was a beautiful day. I followed Muromi River to get to the mountains. I had never been this far downriver before, and I saw lots of really beautiful places near my house. It turns out the mountain isn’t as far as I thought it was! It was only around 7km from my house. I didn’t even know the mountain’s name! But, when I got there, I found out it was Mt. Iimori. Now, I had NO experience climbing mountains, so I did not know what to expect. It was a lot of fun to climb Mt. Iimori, but it was pretty tiring. It was also pretty hot outside, and I was covered in sweat. During my climb, I met a really nice lady who was resting near the top. We had a conversation (in Japanese) about Australia and where I was from. A couple of minutes later, I finally arrived at the top of Mt. Iimori! The view of Fukuoka was breathtaking. Absolutely beautiful. I also met 3 more people at the top of Mt. Iimori, two ladies and a man. The 2 women were resting at the top, and they greeted me when I arrived. I sat with them, and we talked (again, in Japanese) for about 40 minutes! We talked about all sorts of things. Australia, Japan, Fukuoka, jobs, dreams etc. They were some of the nicest people I have ever met in my life! A man arrived later, from the other side of the mountain. He seemed to be a hobby climber, and said he was climbing two more mountains later that day! I was amazed, because he was around 60 years old, but still very fit! He offered to take me to the other mountains with him, but I had to politely decline because I was a bit sick on this day and didn’t want to overdo it. Anyway, after saying goodbye to my new friends I began my descent. It was much, much quicker going down, but a little dangerous. I don’t have mountain climbing shoes, so I almost fell down a couple of times! I was really tired during my journey back home, so I went really slowly, just admiring the beautiful scenery of Fukuoka. 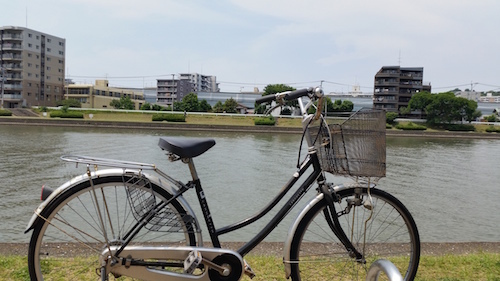 I’ve decided that from now on when I have a day off, I’m going to ride my bicycle somewhere in Fukuoka I haven’t been before, so you can expect more blogs from me in the future! That’s all for today, I hope you enjoyed reading! I’ll have another チャリ adventure blog for you in the future!